Of course, Echo Bridge Home Entertainment aren't the only company to be distributing horror multi-packs. At the present time, the other big players are Lionsgate, Universal, and, of course, Mill Creek Entertainment. During my regular visits to Wal-mart, Target and Kmart (which I tend to hit one after another), I've encountered quite a few multi-packs, multi-features, or whatever you want to call them. Some have been better than others and quite a few haven't interested me at all. 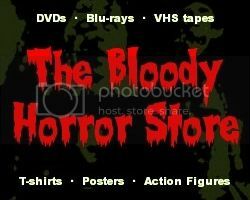 If you surf YouTube in search of horror DVD collectors, you will see some people with so many DVDs that you'll be almost drooling at their apparent wealth. If you look closer at the movie titles, however, you will see that most of these people have no discernment and 90% of their collections are made up of total rubbish which you probably haven't even heard of. The only reason their collections are so big is because they've bought every movie individually no matter what it was. As you know by now, I'm a bit different to those guys. I prefer good horror movies not the trashy ones, and, through my abstinence, I've been able to get some fantastic bargains as the trend towards horror multi-packs has taken off. In this post, I will quickly go through some of the better movie packs from the bigger names. "Drive Thru", "Creep", "Boy Eats Girl", and "Tamara". This was one of the first Lionsgate "4-Film" packs other than some conflated "After Dark Horrorfest" multi-features. It was also exclusive to Wal-mart as far as I know and easily found in their $5 bargain bin. As with all these sets, they weren't silly enough to give away a premium title or an above average movie but this selection really isn't too bad at all. "Drive Thru" is the weakest link but you don't have to watch it. The production values are pretty decent throughout these movies so you definitely won't feel cheated should you ever buy this yourself. "Pumpkinhead II: Blood Wings", "Leprechaun", "Wishmaster", and "Wishmaster 2: Evil Never Dies". I sold my double-feature of "Wishmaster" and "Wishmaster 2" the day after I found this in Wal-mart's $5 bin. The weak link here is "Pumpkinhead II" but you know that they weren't going to put a premium title on here even if they owned the rights to it. Lionsgate also have a four pack of "Leprechaun" movies for $5 which I know a lot of you own. I didn't buy it because I only like the first one and that was in this pack anyway. 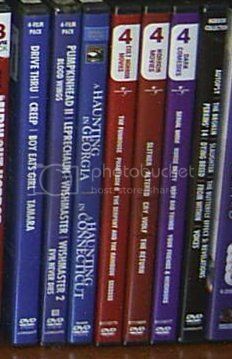 "A Haunting in Georgia" and "A Haunting in Connecticut". This is by Echo Bridge and was out of order on my bottom shelf but I'll say something about it anyway. Both these TV movies are way better than "A Haunting in Connecticut" which I rented and hated. I seriously got creeped out by the original Discovery Channel version and highly recommend this DVD. As ever, there is another Echo Bridge Triple-Pack available with "Haunting of Winchester House" in it as well for the same $5 price. I didn't think it was a very good movie so I don't feel that I lost out by not having it. "The Funhouse", "Phantasm II", "The Serpent and the Rainbow", and "Sssssss". Seriously, Universal, what's the deal here with "Phantasm II" and not "Phantasm"? This is one of the weirder collections with even less of a linking theme than Lionsgate could come up with. All of these are pretty good movies for $5 though and, again, seem to be exclusive to Wal-mart's bargain bin or online purchases. "Sssssss" is known as "Sssnake" in the UK. "Slither", "Altered", "Cry-Wolf", and "The Return". I was very pleased to get this pack especially as I sold my copies of "Cry-Wolf" (nothing to do with werewolves, by the way) and "The Return" at a yard sale. I still have "Slither" double-dipped but never had "Altered" so it saves a bit of space. There isn't really much of a linking theme with any of these movies either except for being in the same genre and even that is debatable. "Serial Mom", "Nurse Betty", "Very Bad Things", and "Your Friends & Neighbours". As far as movies go, this is pure gold but I only wanted it for the first movie and the third. Fangoria did an article about "Serial Mom" so it counts as horror, albeit a horror-comedy, and "Very Bad Things" is definitely the darkest of dark humour. For $5, I'm even tempted to give "Nurse Betty" a try. "Autopsy", "The Broken", "Slaughter", "The Butterfly Effect 3: Revelations", "Perkin's 14", "Dying Breed", "From Within", and "Voices". Back to Lionsgate again with this $5 pack, this really is the way that all the "After Dark Horrorfest" movies should have been released. There are two other conflated packs of the worst of the first two horrorfests which I admit that I was tempted by. I still haven't watched all these movies yet, I think I have three and a half to go, but they are very below average and instantly forgettable. Just by browsing the DVD shelves in your local Wal-mart, Target or Kmart, you will see dozens more of these multi-feature packs. If you are new to collecting, these really are a very good place to start. Only Echo Bridge are a bit of a fly in the ointment by releasing the same movies across many different packs with only one or two changes, but every company has been guilty of the same sneakiness even Warner Brothers with their "4 Film Favorites" packs. A couple of years ago, the end-caps in Wal-mart were full of some of the strangest combinations of horror movies with other movies which I have ever seen. I didn't buy them and forget who put them out, but I'd bet money on it being MGM or 20th Century Fox in a desperate attempt to claw back some money and test the market for potential blu-ray triple-features which are, indeed, starting to appear now. Whether a movie is on blu-ray or a standard DVD, if it's a crappy movie, it will still be a crappy movie no matter what format it's on. My advice, for what it's worth, is to be very careful with the multi-packs and try not to end up with too many copies of "Gothika" and "Dreamcatcher", okay?